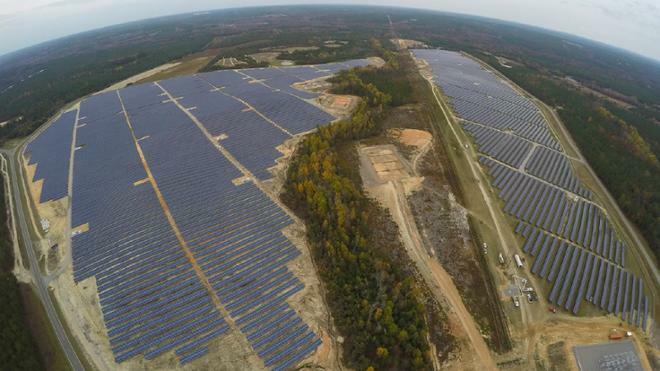 Photo caption: Eden Solar, a 336 acre solar project located near Norman, North Carolina developed and operated by sPower. Spider Solar will span 130 acres. Image courtesy of sPower. A power purchase agreement with sPower, the largest private owner and operator of solar assets in the United States, will enable the construction of a 20-megawatt solar energy facility that will produce enough solar energy to match all of the university’s current electricity needs. Known as Spider Solar, a nod to the university’s mascot, the installation will be located 50 miles from UR’s campus in Spotsylvania County and is expected to go online in early 2020. The 47,000-panel Spider Solar array will produce 41,000 megawatt-hours of solar energy, neutralizing 19,720 metric tons of carbon annually, equivalent to the annual electricity use of 4,909 homes. For every watt of electricity UR uses, Spider Solar will replenish the electric grid with the same amount of renewable energy. The project reduces UR’s greenhouse gas emissions by nearly 60 percent while increasing the state’s solar capacity. With Spider Solar UR will be one of only two higher education institutions in the U.S. to match 100 percent of its electricity needs with a single solar power source. In 2016 UR constructed the first solar array in the Commonwealth under Virginia’s new PPA pilot program, installing 749 solar panels on the roof of the Weinstein Center for Recreation and Wellness. Senior Associate Vice President of Finance and Administration Mark Detterick says the agreement continues the university’s commitment to both environmental and financial stewardship. In consultation with advisory service firm Edison Energy, UR’s agreement with sPower also includes a variety of new educational opportunities on campus, including research grants, scholarships, curriculum enhancements, and vocational education opportunities. The campus community will be able to monitor the solar array’s production via a real-time energy performance kiosk. While Spider Solar will operate as a stand-alone solar photovoltaic array, it will be part of a larger 500-megawatt facility built and operated by sPower. Collectively these projects will make up the largest solar array in Virginia and one of the largest on the East Coast. UR joins U.S. software giant, Microsoft, which recently announced its own commitment to solar energy, signing a 315-megawatt power purchase agreement with sPower’s Virginia facility in March. sPower is owned by a joint venture partnership between The AES Corporation (NYSE: AES), a global energy company headquartered in Arlington, Virginia, and the Alberta Investment Management Corporation (AIMCo), one of Canada’s largest and most diversified institutional investment fund managers.